Generally acknowledged as being the Rolls Royce under the cameras, it's the camera most serious users want to try out at least once in their life. Now, a few years after the start of the digital revolution these cameras are dumped for prices noone would believe if you had told them 5 years ago. A basic, one lens system worth many 1000s of Euros then, now only fetches only something between 500 and 1000. Lenses are still expensive but still a lot cheaper compared to prices a few years back. Heaven for the analog photographer. The origins of the world-famous 6 x 6 cube from Sweden dates back to 1948. After having built air surveillance cameras for the Swedish Airforce during WW2, Victor Hasselblad introduced his Hasselblad 1600F in New York. His experience with building clocks, he now used to build cameras, therefore the 1600F was a master piece of precision mechanics. Being an active photographer himself, he wanted to construct a small camera with a negative format that allowed for high quality pictures. The cube shape was taken from well known camera manufacturers such as Ernemann and Ihagee but unlike his examples, he built up a real camera system where film backs, lenses and view finders could easily be exchanged during picture taking. The Hasselblad 1600F was presented in New York to 20 well known american photojournalists early October 1948. This 1600F was the basis of the most successful professional medium format camera system ever and Victor Hasselblad became in the hall of fame with the most famous camera makers like Barnack, Heidecke and Eastman. As Europe was still recovering from the war, the 1600F was produced mostly for the american market. Hasselblads good connections with Kodak resulted in the mechanically strong Hasselblad cameras being sold with high quality Kodak Ektar lenses. The 1600F was made of cast aluminium and had a shutter in the body, unlike the later 500 Series. Even though 3000 copies were sold from 1948 to 1952, the shutter proved to be problematic, the 1/1600 shutter time was not always correct. Hasselblad changed the shutter to have a maximum shutter speed of 1/1000 second and sold the camera as 1000F. The maximum shutter speed was now much more accurate than that of the 1600F. The 1000F cost new USD 400 and was sold 10000 time between 1952 and 1957. Because of the high dollar rate, Kodak lenses were too expensive for the European market and Hasselblad started looking for an alternative. In 1953, Carl Zeiss was able to produce high quality lenses for a reasonable price and won the contract with Hasselblad. Maybe because of the start of affordable flash photography, Hasselblad decided to change to a system with a central shutter in the lens instead of a shutter in the body. This way flash photography was possible at any shutter speed. Thus, in 1957 a new system was introduced, the legendary Hasselblad 500 Series. 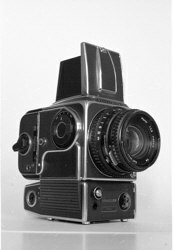 The first camera in this system, the Hasselblad 500 C, was soon the most popular camera for fashion and studio photography. Because the body shutter did not keep light from entering the film plane anymore, a assistance body shutter was put in, which opens shortly before the central shutter opens. Compared to the 1600F and 1000F, the 500C looked, and was, mechanically even more sound. Perfectionism in all details. The price of a basic system, i.e. body, 80mm lens and a back, was DM 2000 in 1957, considerably more than the price of the 1600F only a few years before. Soon Hasselblad started offering accessories for every possible application. Sportsfinders for sports, adapters for microscopes and a motordrive in the late 1960s, which was used in NASAs Apollo moon landing programme. The small film transport wheel was not very ergonomical but it was easy to be swapped for a crank. The crank could then easily be swapped for a larger wheel with a built in exposure meter. Many accessories produced for the 1000F would still fit on the 500C. Compatibility throughout the entire 500 series was maintained, which was surely one of the factors for its success. The 500 C was replaced by the 500 C/M in 1970. Except for the changable focussing screen, Hasselblad had not made many changes. 250 000 500 C/M cameras were produced and it was clearly the most successful camera in the Hasselblad programme. Even when its successor, the 503 CX, was introduced in 1988, the 500 C/M was slightly changed and successfully sold as 501 C and 501 CM. Increased production cost also increased the street price. A basic 503 CX set cost at the time of its introduction in 1988 DM 5000, 5 years later the same set cost DM 7000. 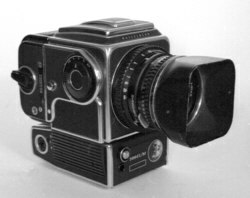 At the same time of the manual 500 series, Hasselblad developed a motor driven 500 series. The first result of this effort was introduced in 1965, the Hasselblad 500 EL, which was actually the first electronical, single lens reflex, medium format camera with motor drive in the world. The idea came from the NASA which needed a motor driven camera for its moon landing programme. You've all seen the pictures taken with the Hasselblads, the pictures of the astronauts on the moon, the imprint their boots made in the moondust and the pictures of the moon lander. The 500 EL is exactly the same as the 500 C, except for the built-in motor drive. The EL was followed by the 500 EL/M in 1972 which was only slightly modified, the main modification was actually, same as with the 500 C/M, the focus screen which could be easily exchanged from now on. In 1984 the ELX was introduced which allowed for TTL flash metering. With the introduction of the 553 ELX, standard batteries became the power source for the motor. A special branch in this series are the Super Wide cameras, the Super Wide C, SWC/M and 903 SWC. With these cameras, the lens could not be changed, the focus screen was removed and replaced with an external view finder to see what the 38mm Zeiss Biogon sees. For some applications, especially for low light photography, it's better to have a shutter in the body instead of in the lens. Therefore the 2000 series (and later the 200 series) was introduced in 1977. Although some accessories can be used, the 500 and 200x series are really two different branches in the Hasselblad family. Hasselblad is a synonym for high quality cameras. Every detail breathes quality, the movements feel solid and precise, the sounds don't say 'cheap' and all accessories are a perfect fit except for one item: the view finder hood. When it opens it gives a cheap metallic 'cling' and it does not have the one-press closing system like the Yashica TLR has. Each side of the hood has to be folded in seperately. But the hood's appearance is still great, especially in the chrome version where the nicely curved 'nose' shows better than in the black version. Without high quality optics, the Hasselblad would never have reached it's popularity it has and had. There are two series, the C series for the 500 series cameras and the F series for the 200x series cameras. The C probably stands for Compur, the shutter. The F series are of course barrel lenses without shutters. It's worth noting that C lenses do fit and work on 200 series cameras, just make sure one of the shutters is always open. Lenses from 1972 onwards have T* coated optics. The Schneider Kreuznach Variogon 5.6 / 140 - 280 was the first zoom lens for medium format. Most information was taken from the German Magazine "fotoMAGAZINE" January 1999. Thus telling that a camera with serial number of "UR5555555" was produced in 1978 (U=7, R=8). Take the lens off the camera, look on the inside wall of the back of the lens and turn the focussing ring. You will see a red 3- or 4-digit code inside. The first two digits are the year counting from 1957, the last one or two digits are the month. For example the code "1506" would mean this lens was produced in June 1972 (1957 + 15). The code consists of one letter and two digits, the letter is the month (A = January, B = February and so on) and the two digits are the year backwards. For example the code "D68" means April 1986. There might not always (is never?) be a code in the lens. In this case you'll have to find the Zeiss production tables and check your serial number against them. Unfortunately I have not be able to find one on the web yet but there is a three volume book titled "Fabrikationsbuch Photooptik" by Hartmut Thiele listing all Carl Zeiss lenses ever produced, approximately 20 million. The desired information might be in there. Over the years, Carl Zeiss has built 80 mm Hasselblad lenses with different front bayonet sizes. Since many people buy simple accessories such as filters from eBay or other auction sites, there is some confusion about which size filters go with which lens. It's easiest to tell by measuring the size of the inner bayonet, the one in front of the front element of the lens. When it's about 57 mm (2.25") you will need a filter with a B50 (also called B57) bayonet. When it's larger than that, i.e. about 67 mm (2.64") you will need a filter with a B60 bayonet ring. Note however that the Distagon 50/4 does not have a front bayonet but needs special Hasselblad filters with an approximate diameter of 63 mm which will be dropped in and locked by the screw-in retaining ring. Make sure this ring is included with your distagon as they are very hard to find. Of course this not only goes for the 80 mm Planars but for any lens that has been made for Hasselblad cameras. You could also buy a conversion ring, two popular versions are available: B50 to 58mm thread and B60 to 67mm thread. Since the filter sizes for B50 and 58mm and for B60 and 67mm are approximately the same, there won't be any vignetting and the lens shades usually still fit when the filter is screwed on the adapter. Especially useful when you already have some screw-thread filters in the correct size plus that those filters are easier to find in your local shop and usually for less money than those with a Hasselblad bayonet mount. Note that although readily available, B50 to 52mm conversion rings, even though they sometimes work, are really too small. You'd better not take any chances and buy the proper adapter straight away, they're inexpensive and even when buying new filters, the combination of a used conversion ring plus standard filter is often cheaper than a Bay filter. Heliopan has made a Bay50 to 52/58 conversion ring. 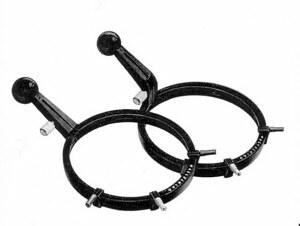 This rings allows you to use filter with standard 52 and standard 58mm thread. It seems to me like the best solution and when you're very lucky, you can find one for cheap on one of the auction sites or the box with left-over goodies at your local photo shop. Motorized (i.e. EL, EL/M and ELX) Hasselblad cameras may be released in several ways. The standard, manual way is by using a soft release button inserted in one of the front busses. The top and the bottom bus will both work. In the newer EL cameras these release busses are different however. Take special care when using digital backs as i nthat case one bus is the right one to use. There were also some large buttons available, NASA style, that would connect to both front busses, perfect when wearing gloves. These front busses may also be used for the dedicated cable release. These came in various lengths and are not always quite cheap. The side connector, i.e. the 5-pin DIN bus on the side, may also be used for a remote release cable. Hasselblad has made dedicated cable releases for this bus but the connector is standard, or rather, was a standard audio plug. What is basically does is to short pins 1 and 3 when the release button is pressed so when you're handy with a soldering iron, you could make such cable yourself. When using mains to power the camera in the studio you may also use the remote release cable in the bus on the power supply for releasing the camera. Manual Hasselblad cameras have a standard cable release socket so you may buy any good quality remote release and use it on the manual cameras. Of course there are also official Hasselblad cable releases but those can be quite expensive and they're not much different from any other quality cable releases. When you using the cable release with a flash bracket, make sure you'll either get a Hasselblad cable release or else another brand that fits in the cable release socket. Or just get a standard cable release and some duct tape. Especially designed and made for action photography are the Sports finders. They looked so nice on the big auction side that I also wanted to have one. They are made from some kind of light metal (aluminium) and may be used with several masks. The standard frame covers the field of view for a 80mm lens. Clear blue plastic masks with a cut out for any lenses with a smaller field of view could then be purchased. So there are masks for the 120mm and 150mm lens. To use the camera with one of these masks means that the camera should be used on it's side, not that it matters on 6x6 pictures though but it's something to get used to. Everything on these sports finder breaths Hasselblad quality. It fits snuggly on the accessory connector on the left hand side of camera, easy to slide on, easy to slide off but there's no way it will slide off by itself. You'll then open the sports finder by pulling out the eye piece and you'll set the approximate distance by sliding the eye piece back and forth. It really looks and feels like high quality engineering so definitely something to have when you're a collector. And it might also come in handy when doing action photography. One funny and useful thing to have is the Hasselblad exposure meter knob, which was actually made by Gossen until sometime early 1980s.  The exposure meter is a selenium cell meter, therefore working without batteries, and can be used for both incident and reflected light metering. Of course when using it as an incident meter, you'd either have to take your camera to the subject or take it off and use it as a normal, hand heldexposure meter. The meter is comparable with the 1950s-1960s Gossen Sixtomat and Sixon exposure meters. See my Exposure Meters section for more information on these meters. The trick is that it goes on the side of the camera replacing the winding knob. This makes for a compact package when using the camera for hand-held outdoor photography. Of course "compact" is only relative, we're still talking » Hasselblad « here. The knob exposure meter can be used just like any other selenium cell meter. It is a light sensitive as any other Gossen selenium meter meaning it will be sufficient for daylight photography but it does not work properly in the dark. Attaching the knob to the camera is easy, hold the camera firmly or place it on a flat surface and take off the original winding knob or -handle by pushing and shifting the little level on top. The take the metering knob, lign up to the red dots and push it on winding axle and that's it. Since the winding mechanism always winds a full 360°, the front of the exposure meter will always point to the front of the camera, a pretty neat trick. The readout shows the direct EV value but of course you'll still have to think about how you want to expose the film, just like with any other light meter. So in case you don't want to carry a modern exposure meter such as the inexpensive Gossen Digisix around your neck but prefer to have a camera with built-on exposure meter instead, by all means get one of these. It definitely looks cool. The rail that holdes the sliding bit is made from very thing black plastic which can easily break. When you buy one, make sure this rail is still in place else the knob only looks half as cool. Quick focussing is possible with the Hasselblad but in order to focus even quicker, they have produced the focussing handle. It actually does work quite well but maybe there is a little bit of truth in it's nick-name of "lens killer", when you're using it, don't go easy of the focussing mechanism, better be careful now than sorry later. The difference between those handles is not the diameter but the fact that the arm on the number 1 is extended a little more to the front than the number 2 handle. When you would mount a number 2 handle on the 105 Sonnar or smaller lens, it might hit the shutter release button. The picture on the right, a scan from an early 1970 Hasselblad product catalogue (courtesy Jacques Emanuel) shows the difference. On the left the number 2 handle, the number 1 on the right. The focussing handles came with little coloured pins which could be used to mark focus points, for instance when you would know the subject of the picture would move between 2 and 10 meters, you could set a pin at 2 and a pin at 10 meters and focus only between these markers. Unfortunately these pins are so small, they often got lost, hence second hand focussing handles often come without any pins. Arguably the best book on the several Hasselblad systems is The Hasselblad Manual by Ernst Wildi. Although quite expensive for a book this size all questions I've ever had are being answered and it's regarded by many as the ultimate book on Hasselblad. The current edition is the 6th and dates from 2003. The V-, H- and X-systems are being discussed thouroughly. For information on the older pre-1980 systems such as 500C and 500EL/M it might be better to look for the 5th edition but the 6th has worked fine for me, especially when used together with a copy of the original manual. My second and third Hasselblad. 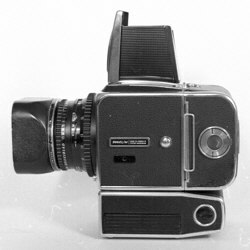 Hasselblad 500 EL (the predecessor of the 500 EL/M). Manuals on many cameras, including the Hasselblad 500 C/M, 500 EL/M, and SWC/M. Many Hasselblad manuals in PDF format, including the various systems and backs. eMail M. Butkus to get the manual you need. A lot of first, second and third hand information on Hasselblad. Hasselblad 500C/EL Users Guide written for users of older 500C/M and EL/M. 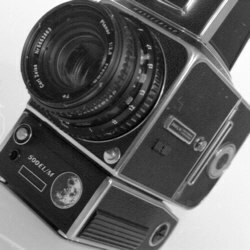 A website in German about the Hasselblad System. Contains also some repair information. has a very good reputation for Hasselblad repairs. Carl Zeiss and Carl Zeiss Jena company information.